Summer has finally reached us here in Vermont, and we are looking forward to the July 4th holiday outside with friends and family. What better way to celebrate our country's birthday than a barbecue or pool party complete with decorated 4th of July themed cookies? 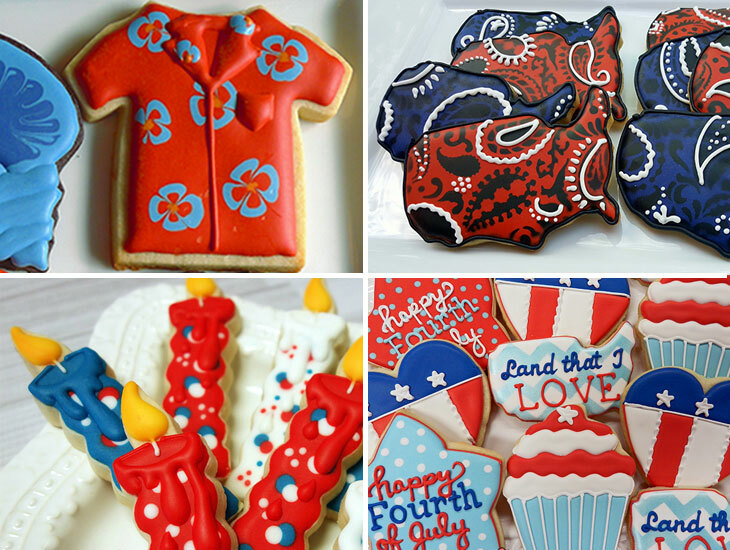 Get inspired with these July 4th cookies from some very talented cookiers. Photo courtesy of My Little Bakery. Celebrate Independence Day with this bold and beautiful design featuring a variety of our cookie cutters. You can decorate these shapes with any design, but we especially love the American Flag theme on the hearts. Shapes for Independence themed cookies include: Flip Flop Cookie Cutter, Cupcake Cookie Cutter, Star Cookie Cutter, and the Gingerbread Man Cookie Cutter. Photo courtesy of Karla at 1smrtcookie. Maybe some of you will be having a barbecue at the beach this summer, why not add these patriotic cookies for dessert? Just make sure not to confuse a real starfish for your decorated cookie when you go back for more. Popular shapes include: T Shirt Cookie Cutter, Starfish Cookie Cutter and the Crab Cookie Cutter. Photo courtesy of Jill FCS - Funky Cookie Studio. The United States of America was born on July 4, 1776 and you can decorate your birthday cake with these red, white, and blue candle cookies. The candles can be decorated in a variety of ways and are a simple shape to handle. Use our candle cookie cutter for this design. Photo courtesy of DB Sweets and Treats. Our plaque cookie cutters are perfect for your favorite American mottos. Easy to decorate for children and have endless imaginative possibilities. Popular shapes include: Long Fancy Plaque Cookie Cutter, Square Plaque Cookie Cutter and Oval Plaque Cookie Cutter. Honor the birth of our country and its present day geography with a USA Map Cookie. Add a fun road-trip theme to celebrate the freedom of the open road and kick off your summer vacation in style. You can also decorate the letters U, S & A to give hommage to the country you love. Popular shapes include: USA Map Cookie Cutter, Letter U Cookie Cutter, Letter S Cookie Cutter, Letter A Cookie Cutter. We love this ultimate celebration of the American spirit! Follow some of these designs and put Red, White, and Blue on all of your cookies this 4th of July. For more 4th of July cookie ideas, visit our Pinterest page or visit the wonderful cookiers whose work is showcased on this page. Best wishes for a tasty 4th of July!